If you are an athlete, you already understand the importance of speed and agility when you are on the field or court. Competitive sports push you to constantly improve and hone your athletic abilities. At O Athletik, we have the knowledge and tools to help you reach your athletic goals, including classes and equipment specifically geared toward speed and agility training. We have our training down to a science, as it’s important to understand how the human body operates in order to improve its conditions. We understand that in order for one to reach their top speed, they must train at their highest intensity. Sprinting is a great example of a way that athletes can train their bodies to reach their full potential. The scientific term is called neuromuscular conditioning, in which you constantly challenge your body to reach beyond its previous capabilities into new territory. Simply put, if you can sprint at full speed during practice, then you can run that much easier during a game. Train in our state-of-the-art facility, complete with an indoor field that allows us to adjust the temperature of the room. No matter what the weather is like outside, rain or shine, our indoor field is in pristine condition and ready to be put to good use. Our “O-gility” class is designed for beginners and seasoned athletes alike, and is focused on the improvement of dynamic movements, stamina, speed, acceleration, and deceleration. In addition to honing your athletic abilities, our O-gility class is a great workout in which you can expect to burn anywhere between 400 and 600 calories. This class is a great two-for-one in which you can get in a good workout and train your body at the same time. You are sent through ladders, mini-hurdles, cone work, and sprints to test and improve your overall speed and agility. The variance in tools used in this course helps to train your body in different areas at the same time. These tools are designed to improve the body’s ability to move and change direction quickly while maintaining proper posture and alignment. This method of training can be a great tool for injury prevention by teaching the body to stabilize areas like the shoulders, lower back, and knees while moving quickly. 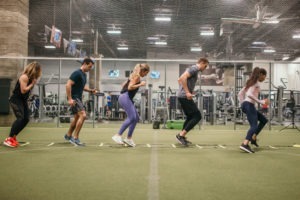 When searching for a gym where you can go to improve your skills, you should look for a facility that accommodates your need for speed and agility training. If you are an athlete, you need an intense workout that’s going to push your limits and prepare you for your next big game. O Athletik is a Houston gym designed for goal-setters, athletes, and fitness fanatics that take their workout regiment seriously. You can visit our class schedule and find the next available O-gility class. You can also browse our multitude of other classes that we offer at our facility. There is something for everyone here!